Kelsey Kastrava, editor in chief of Cabrini College’s student newspaper in 2010-2011, depicted in the initial article on Sudan exactly what the stakes might be. Her article, “Students organize over Sudanese conflict,” reported on Griffin’s talk and the response by CRS student ambassadors on campus. Cabrini College students are rallying together to raise awareness and prevent what many are calling a potential massive war in Africa. If Southern Sudan votes to separate from the north in a January election, a tragic war could break out, adding to the four million casualties of the last war and the suffering that still exists in the two poor regions of Sudan Southern Sudan and Darfur. “Our goal is to get the attention of local media and eventually national media by partnering with other colleges and universities in the area,” senior Eric Gibble, president of Catholic Relief Services Ambassadors at Cabrini College, said. Quickly, a group of video students responded and produced a video that CRS could use to explain the issue to other students. Kara Schneider, a 2010 graduate of Cabrini, became the producer and engaged current students in the production. The video, “Never again begins now,” was featured on the CRS website. Kelsey continued her reporting on Sudan throughout the year as the government of Sudan and region of South Sudan negotiated the potential referendum regarding independence. 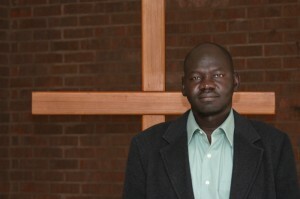 After reading Dave Eggers‘ book, “What Is the What: The Autobiography of Valentino Achak Deng,” a novel based on the true story of a Lost Boy of Sudan, she attended a media event organized by CRS and was able to interview a Lost Boy, the now-grown Malual Deng Duot. Her profile of him was accompanied by a video interview done by Danielle Alio. To accompany this multimedia package portrayal of Malual, Kelsey wrote a profile of an exceptional woman, Barbara DiLucia, who received six so-called Lost Boys into her home and raised them over a period of years. The first time she met them, Barbara didn’t know they would become her “sons.” They were the orphans who trekked across East Africa. They were the “lost boys” of Sudan. Now they were living in her town. She didn’t intend to take any of them into her home.“I prayed about it for quite some time, and because I’m a widow now and I live here by myself and to take in some strange kid from another country, you know especially some man, was kind of a daunting challenge,” she said. Barbara Di Lucia met the Sudanese lost boys through her parish. She, along with other members of the church, agreed to sponsor six young men that had endured years of hardship in a place where war had taken their family, friends and childhood. Kelsey dramatically tells the story of a woman who did not intend to do anything exceptional but who just continued to make choices that seemed right to her and that led her down a path to accept a group of Lost Boys into her heart and home. One of the lessons for journalism students here is that a speaker in one class can lead to a series of exceptional media creations. A number of students realized that the speaker was introducing them to an historical moment and that they could report on changes happening half-way around the world. Great reporting, writing, and video were able to make distant events vivid and personal. Energetic background reading, research, and hunting down sources paid off for the reporters involved. Kelsey submitted her Sudan package to the Religion Newswriters Association contest and her stories won second place in the Chandler Award for Student Religion Reporter of the Year. Danielle’s video was part of a package of video reporting that won her first place in Maryknoll Explore My Mission contest, which resulted in a two-week trip to Asia for her. Danielle’s submission can be viewed here.